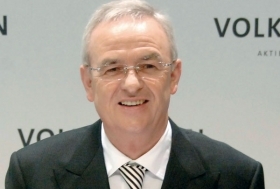 Winterkorn is the highest-paid top manager among Germany's biggest companies. FRANKFURT (Reuters) -- Volkswagen CEO Martin Winterkorn will be paid 14 million euros ($18.7 million) for 2012, 20 percent less than the previous year, a German magazine reported. Der Spiegel, which did not cite sources, also said VW's supervisory board would decide on a new compensation package for all management board members at its next meeting on Feb. 22. In future, bonuses will only to be paid to board members if the company's profit reaches at least 5 billion euros, the magazine reported. VW declined to comment on the report. Winterkorn himself proposed that he should take a pay cut, Der Spiegel reported last week, as the company prepares for wage talks with production staff in western Germany. Current rules on executive pay, combining fixed salary, bonuses and profit incentives, would boost Winterkorn's total compensation for 2012 to about 20 million euros from a record 17.5 million euros in 2011, a company official previously said. Winterkorn is the highest-paid top manager among Germany's biggest companies. The IG Metall labor union has called for limits on top managers' pay packages.